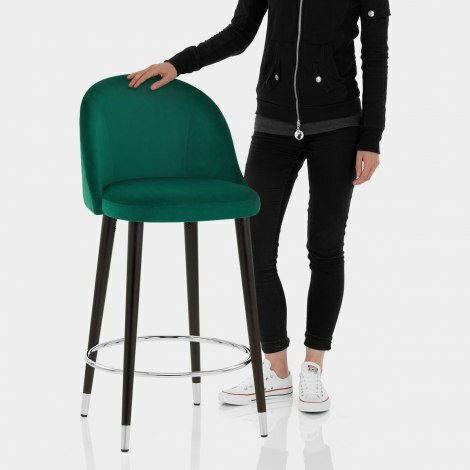 Bringing modern elegance to a classic fixed height stool, the Polo Bar Stool Green Velvet has striking style that is not to be missed. A refined item with a ravishing colour scheme, the Polo is the perfect statement piece for the kitchen worktop or breakfast bar. Enhanced by dense padding throughout, the seat is covered in alluring green velvet upholstery. Meanwhile, the high backrest is detailed with simple stitching and has a comfortable curved design to match the seat. Delivering strength and stability, the four-legged solid wood frame displays a stylish dark wenge finish. Practicality comes with the round chrome footrest, and is accompanied by chrome tips, contrasting nicely against the rest of the frame. Last but not least, small protective plugs help to keep floors safe and are adjustable for use on uneven flooring.